That magical place where palm trees line every corner, flowers seem to dance in your hair, and being cold is a long, distant memory. I don't know about you? But that is definitely not where I am today! So if we can't be there then at least our planners can, with this beautiful Essentials kit from the Glam Planner. 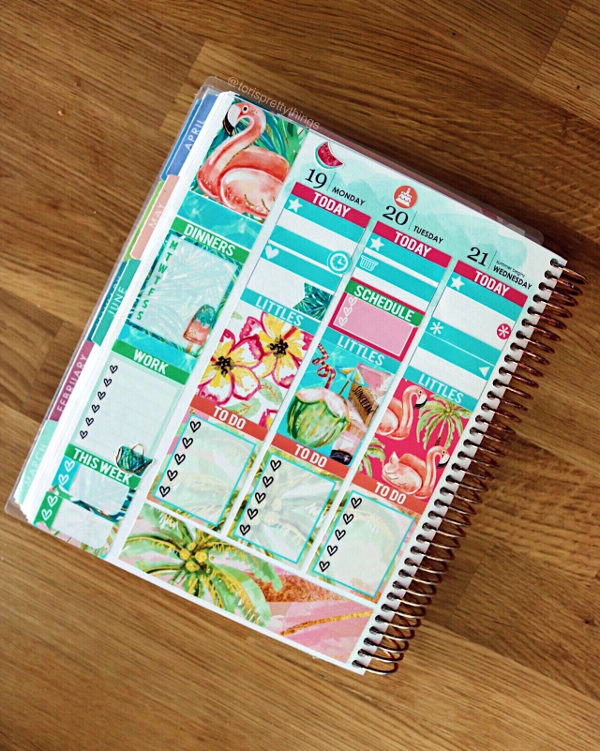 Today I'm bringing you a little vacation inspiration and a few functional tips for your Erin Condren summer spreads. I swear I'm not affiliated with Glam Planner, I swear! lol I'm just such a fan of her products. If you love glam planning, or scrap booking in general, then you can probably relate to feeling a little lost without a creative outlet. I tend to invest in my creative outlets (hello, nail polish collection!) and just find GP stickers to be the best quality for their cost :). Plus, let's be real - I've been following Elle and her YouTube channel for the last eight years. So when the gal who taught me how to put on makeup shares something? I listen :). The best part? For once, I'm writing about a kit that is still totally accessible (at least as of writing this post)! 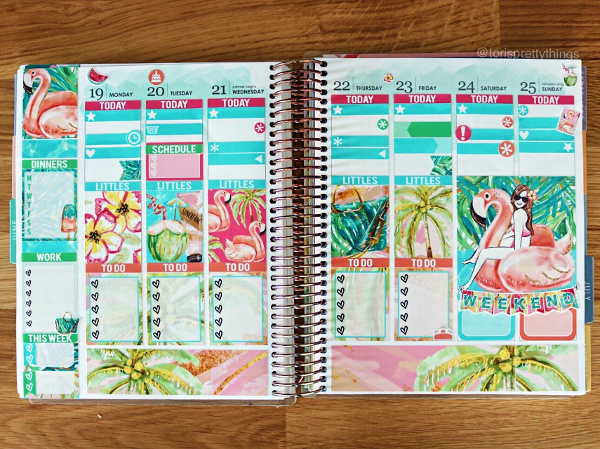 If you want a little piece of Paradise in your planner, then I highly recommend scooping this one up. Also, let's talk a little bit about the Erin Condren sidebar. 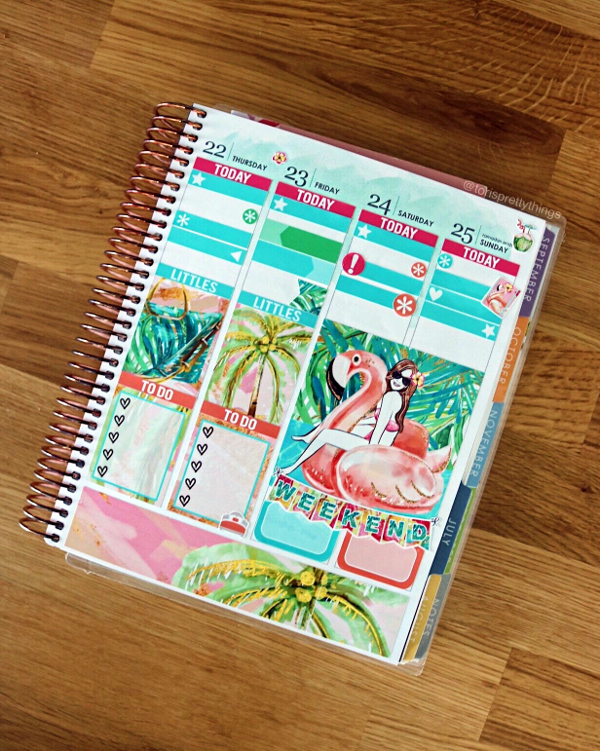 Yes, that super customizable part of your weekly planner that can either be an exciting canvas...or an overwhelming blank space! What I love about the EC sidebar is how you can quickly flip through your week to week and get a glimpse of this list. So I love to make a note of what we cooked, where we ordered from or where we went to eat. This makes for a great, quick visual to either recycle recipes or remember great restaurant finds. I also like to keep track of when I sign on and off for work. Since I work from home, I like to keep an eye on my sign on and sign off time. This helps to give me a little more structure in a less structured environment. This week, I added a new item to my sidebar - my blog posts! I'm now keeping track of what posts I'm writing in a given week. And for the second half of the week, would you look at that double box?! If being her doesn't define paradise, then I really don't know what does. Tori's Pretty Weekly Wrapping - Why hello, Spring! Tori's Pretty Life - "The Summer Wind Came Blowing in from Across the Sea"
Tori's Pretty Style & Beauty - "Who Wears Short Shorts?" Tori's Pretty Plans - "All Dressed Up in Love"